Katpadi is a major junction located in Vellore district of Tamil Nadu. This railway station comes under the jurisdiction of Southern Raiwlays. Station code is KPD. 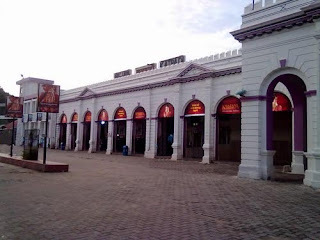 Katpadi junction is connected by Chennai-Bangalore and Villupuram-Tirupati main railway lines. It is a busy junction connecting all major cities of Tamil Nadu, Karnataka, Andhra Pradesh, and Kerala. It is on the border point of Andhra Pradesh and Tamil Nadu. Chennai-Bangalore Shatabdhi stops here. Katpadi station is linked to four routes: North-East (Chennai), North West (Andhra), South West (Coimbatore), and South. It is known as Vellore-Katpadi junction. Vellore, Arcot and Chittoor are nearby cities. Tirupati airport is the nearest airbase which is just 100 km away from Katpadi. Katpadi is well connected to Tirupati, Chennai, Bangalore, and Tiruvanthapuram. Major trains passing through this junction are Sanghamitra special, Nizamuddin express, Nagarcoil express, Chennai express, Nilagiri express, Swarna Jayanti, Bagmati express, Shalimar express, and Himsagar express. More than 150 trains run through this junction every day connecting Orissa, Bihar, Uttar Pradesh, Jammu, Jharkhand, West Bengal, and Madhya Pradesh.